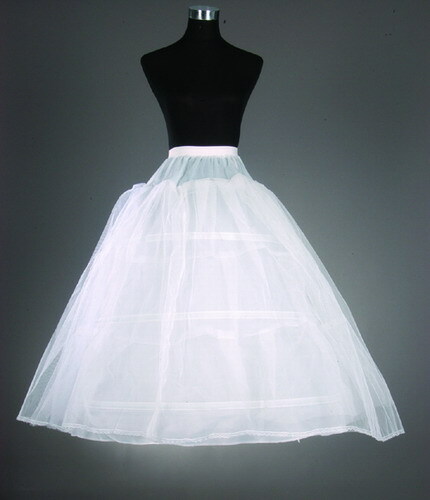 Aside from workmanship and embellishment, petticoat also acts as an important role in wedding dress stylizing. It is used to adjust the shape of wedding dress and can hold the wedding dress out in a pleasingly domed shape and give the impression of a smaller waist. Different petticoats can be used to give dress different looking. Don’t forget, wedding dress with long train also needs a petticoat. The shop where you buy your dress should hire you one at a reasonable price. By reasonable I mean no more than twenty pounds. If the shop charges an exorbitant rate to hire a petticoat or will only sell you one then look on the internet. 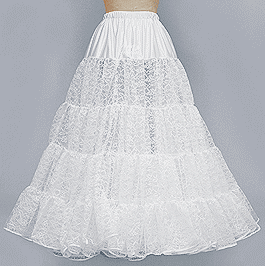 It is possible to buy petticoats on the internet for a lot less than most shops charge. The waistband is an elasticized section that sits just under your bra cups. Sounds weird but this allows less fabric bunched up around your waist and the skirt hangs freely. Two tiered layers of pleated netting are attached to the lower half of the skirt. The netting is sandwiched between 2 layers of nylon lining material. Some fabric stores call this nylon material “crinoline”; it is even labeled crinoline on the bolt. It is important to note that crinoline can mean many different things to many people. With regards to fabric, crinoline could be the nylon lining, horsehair & linen blend or something more closely resembling netting. At any rate, this nylon skirt doesn’t breath well. I sweated profusely on my wedding day…well, it was 80 degrees F too but I was inside mostly. The ball gown slip only made it through the first 30 minutes of the reception. I couldn’t suffer with it any longer.